I wake up after getting less than six hours of sleep and Julie has already eaten and plans to ride a carriage to the Treasury. I went to the toilet and thought about my options and food was first on the list. I sat at a table and ate my red and yellow selection (eggs, tomato, bread with jam, yogurt, and cereal with apple) and then walked to Petra to try the day after last night. I bought a 50 JD ticket, a discount for staying overnight, with three hours to enjoy it. 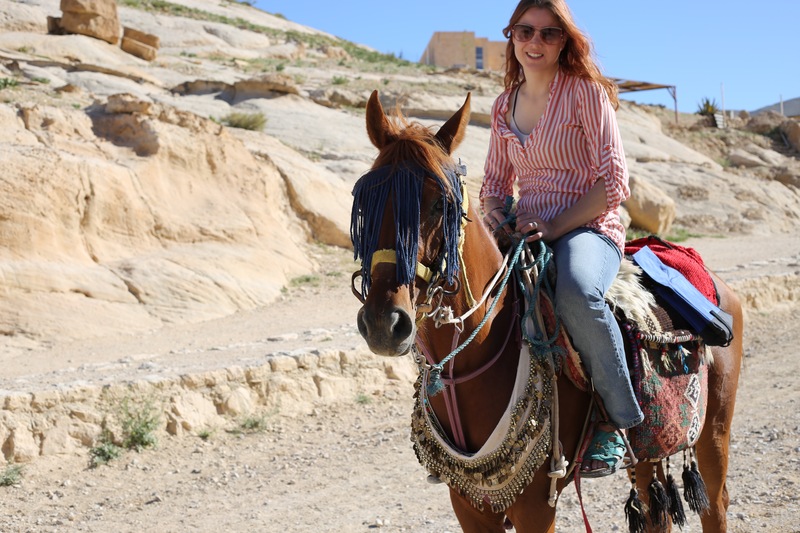 Included, is a horse ride to the entrance of the Siq, and a free guide. I’m hesitant at first for any distraction, but I figure it’s only part of the way, so… I took the ride and my guide, Ahmed, with the belief that I’d travel down past some dirt and rocks and then leave him to take a thousand photos of whatever beauty lay behind my eyesight last night. 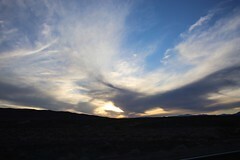 Like everywhere else in the world, pictures and people’s descriptions don’t do it justice. I’m in awe of the city that has been carved into the rocks – what did I think the luminaries were on last night – and I get to see part of it while on a horse. 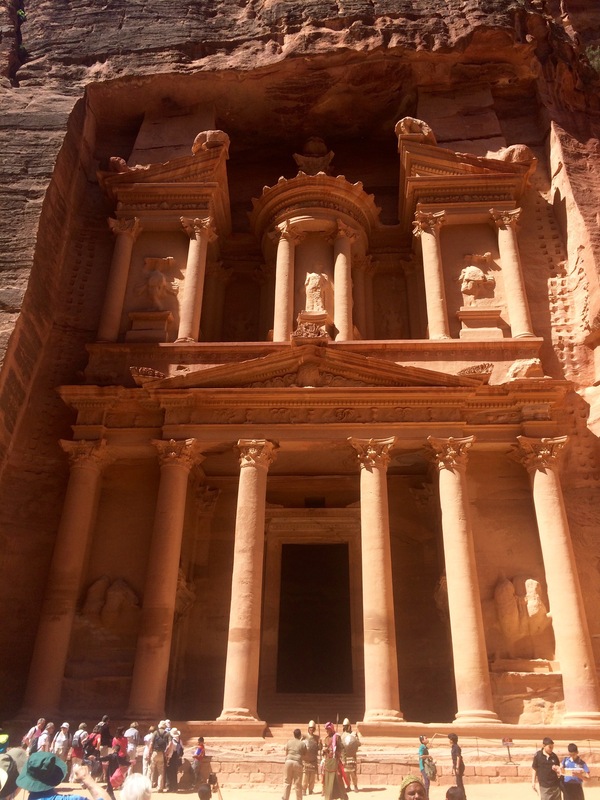 Ahmed, convinced I wasn’t a regular tourist, wanted me to see Petra from another angle – and I thought that’s what he was doing. He said I was hard to convince (a man taking a woman alone off the trail), but he got me into the mountains – and I’m so grateful for his persistence and seeing the adventurer in me. I could’ve trudged through the crowd, like most places when that’s the only option, but for those seeking something more – leave your horse and step into the trees. The path will appear and the excitement grows. He ensured me that I would see the Treasury and more. 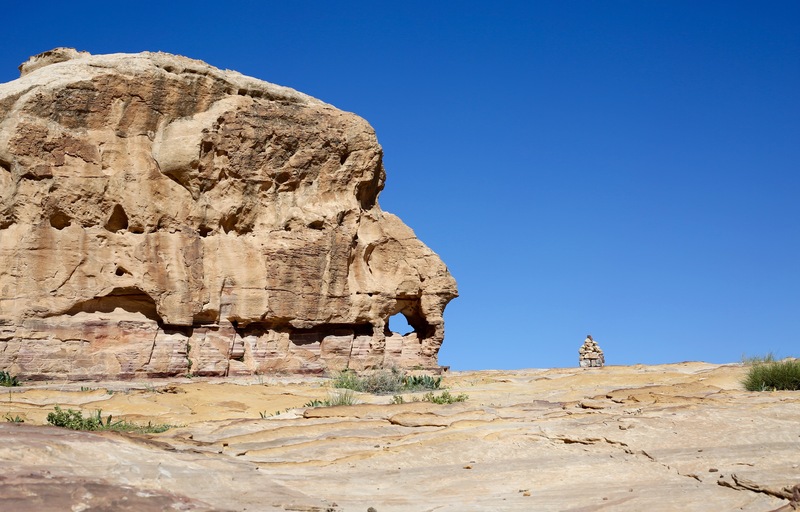 While the others marched between the sandstone, I’d be climbing on top of it allowing me a vantage point down into the canyon and up to Jabal Haroun (Aaron’s Mountain) in the distance. I took pictures of plants, living and dead, along with rocks and their shadows, as if I was a scientist and would use these in a lab later – and I suppose in a way I am, as they help me recall the cool of the air on a hot day and the weird sense of being in the middle of a powerful trading junction some 2,000 years ago that’s now concerned with the removal of historic artifacts, the education of its children, and the welfare of its animals. Some turns I would’ve been lost, but others are marked with cairns, steps, or worn trails if not over the flat rock, but I feel as if Ahmed could walk this in the dark. Jordan has left the park ‘open’ (if you can find the local entrance) and only charges its residents, over age 15, 1 JD per day to enter because 1) they’re making enough money off tourists, and 2) it is part of their heritage and they feel they have a right to it. I’d say we should do the same in the States, but maybe we don’t know the value of our history and natural beauty. I’ve told Ahmed that I’ve got three hours, so he is constantly checking the time, and when I’m winded we have time for him to point out details and take my picture, but when I start to slow we must move to make time – and he’s sad that I don’t have the day to hike other trails and come back tomorrow and see more of the park – me and him both. We get to the top, the opening, the field; and there are carvings and etched script, a brown dog, red and purple poppies, and other people. I’m happy to know I’m not the only one who wants to see things differently, but I’m also grateful when we leave them behind with their arms and legs showing, and loud shoes. Ahmed picks up a rock and scratches it and then rubs it on me – local makeup. I should’ve kept it, but acquiring water from a man on a donkey would cause me to change priorities. I didn’t realize how thirsty I was until he stopped him, then I was grateful and offered to share, but he said I needed it more. I got to see the Roman Theatre, that may blend in with the surrounding Red Rose City from this perspective, but the people, along with the roads and modern buildings show how large the structure really is – with 4,000 to 8,000 seats. Next, is looking at the top of tourist’s heads in the canyon, as I’m on the rock that makes up Al Khazneh (The Treasury). 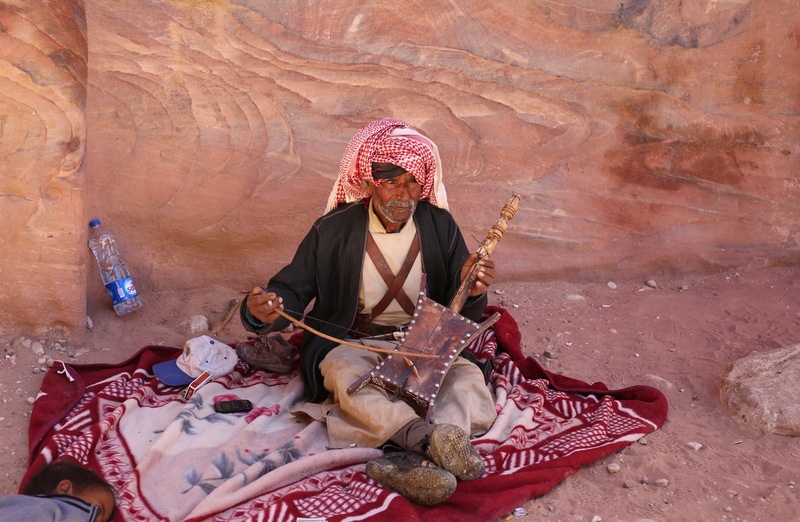 I can look across at the Bedouin tents with solar panels and the hikers on the other side so they can see the carving ahead of them, but I don’t have time for all the steps, and hours, needed. We stop in a tent for a bottle of water – this one I pay for. Ahmed asks the guy to take some pictures of us together, especially after he puts his keffiyeh on me, which I still have. Then the water man tries to sell me an old Roman coin for 50 JD – which might be fake, stolen, overpriced – and I’m not a collector. The steps that most people don’t want to bother with are the ones I‘m able to come down easily. I pass donkeys and the man sweeping their poop into the canyon; the women selling jewelry and magnets; and the tourists with their cameras, wide-brimmed hats, and water. I don’t blame a donkey for taking a nap between the rock and shrubbery. He is trained to carry people up the stairs and then returns alone for his next trip where he provides shade for dogs and their people while he waits. I would be hiding too. I get to look at the grandeur of the place while trying to spot the details among the shade while a girl, with her family, whom he’d given a tour to yesterday was there and greeted him with candy for his daughters – the ones he doesn’t have, so we shared. He told me he was getting married, but that might also be a ruse. I don’t blame him for milking us tourists for what we’re worth, because it isn’t his imaginary family that helped me enjoy my time, but his kindness and knowledge. 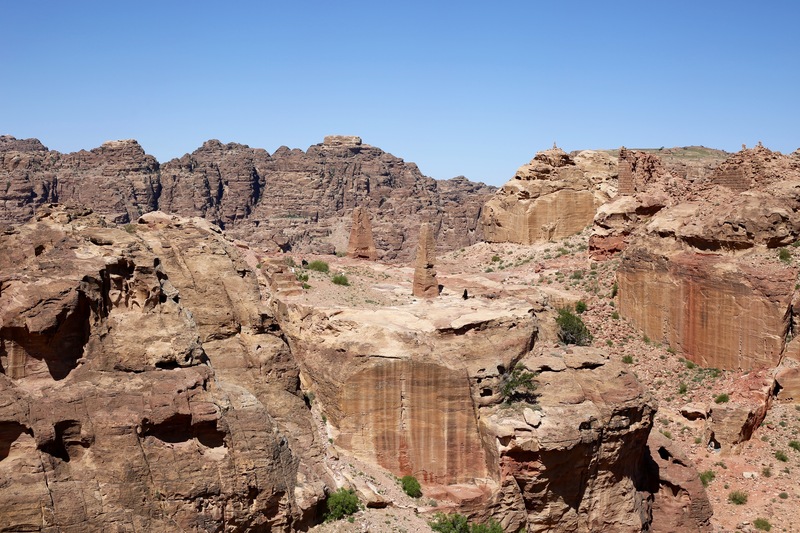 There are camels to ride, musicians to listen to, and gardens to spot in high crevices among the already rich gathering of colored stone – something that could inspire the great artists from 1860 to 1970, like Monet and Richter – which led me to this music video. I think all the hiking and sightseeing before the Treasury came into view lessened the excitement (just as seeing Half Dome is diminished after witnessing the awe-inspiring place that is Yosemite), but it’s these postcard images that make a place important enough to preserve, so that others may come and appreciate the rest. I get my picture taken in front of the Treasury, along with the costumed guards, children, and camels. Ahmed is good about taking photos of me throughout our hike and offered his hand on slippery sections to keep me from falling. He joked that he would give me 1,000 camels to marry him, but in all seriousness that’s a $700k to 15 million dollar offer that would leave Caleb as my new brother as we traveled the world – riding, eating, racing, and selling camels. 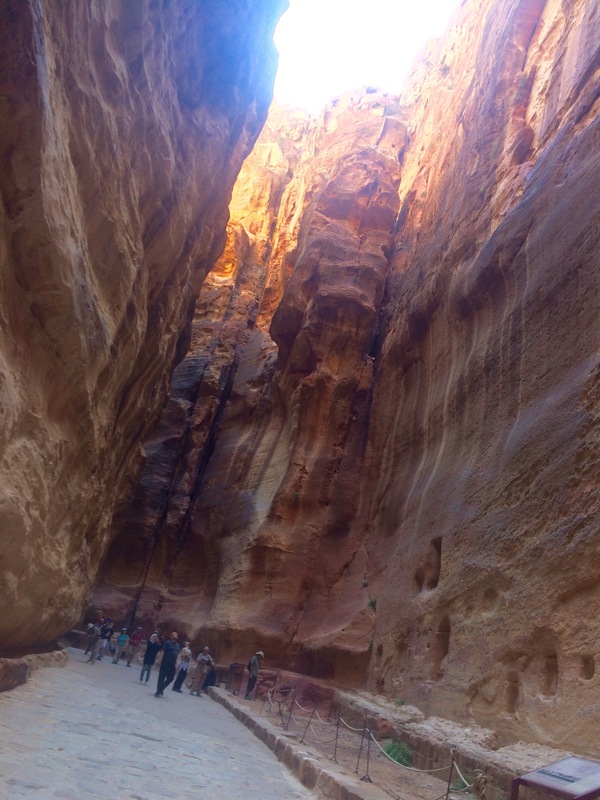 The walk back through the Siq is very different in the daytime. The candles and stars have been replaced by loud horse carriages in a hurry and an old lady living in the moment with a better grasp of how little time we have. We’re both enjoying the details of what surrounds us – breaking the view into pieces that our minds can digest, as trying to take in the blend of nature’s art and man’s work can be overwhelming. Coming out the other side, I got a photo with the guards and then rode another horse back to the entrance. I told Julie I would meet her at the room at 11:30 am, though I didn’t need to be there till noon, so I stopped by to see Abdallah. He was laying on the floor, hung over from last night. I went to the father/son shop to get a discount on water and since they’d gone home I got a small one for free. Ahmed followed me to the hotel because he wanted to take me to Wadi Musa Spring and said he’d wait outside while we checked out. Julie offered me a falafel she’d gotten from Abdallah that I ate while she finished packing. She came outside and was ready to leave. I bid Ahmed goodbye. He gave me his number and I gave him the 30 JD we agreed on. There are guides you can book online, companies you can go through, or haggling to be done – though I know I still overpaid, I got a good deal today. As we got to the city limits, Julie changed her mind about seeing that spring, so we looked for it with no luck and no help from the police who don’t speak English. We drove out of the city for the second time that day and made our way to Montreal Castle, built by Baldwin I of Jerusalem in 1115 and renovated in the 14th century by the Mamelukes – slaves of the king, considered to be true warriors that would go on to carry positions of power – and who were responsible for ending the Crusades in 1291. 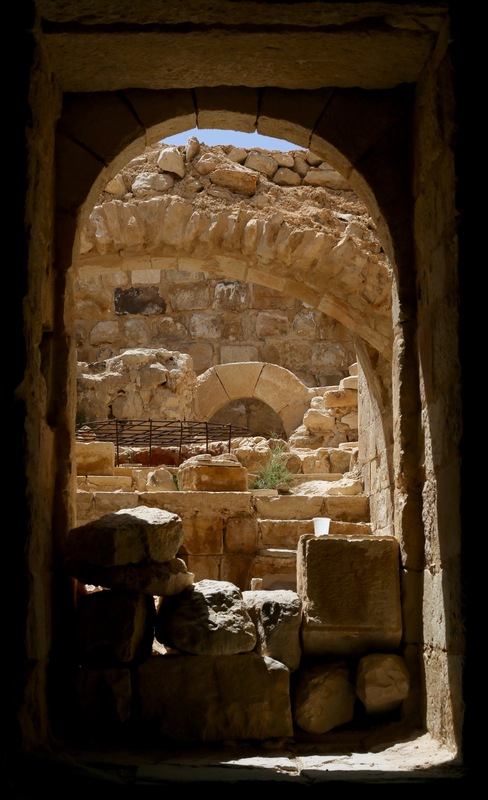 He showed me the wine-press made into a sugar press when the Muslims took over, the safe in the floor where they stored gold, and the 365 slippery and crumbling steps to the well (we only did twenty). He pointed out where they could hang up to three people at a time, where the Arabic school was, and the market that sold jewelry and spices. There was a room with cannonballs and reliefs and we sat down, with me in the queen’s throne, and enjoyed the sun through the skylight. 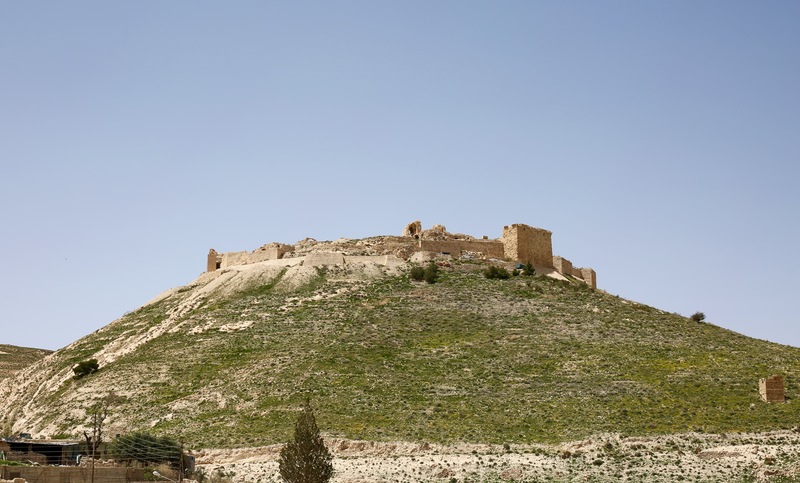 The castle might not look that spacious from a distance, but the builders took advantage of the mountain. I tipped Thallal 2 JD for his efforts of translation and kindness. On my way down the hill, I yelled into the canyon again. Julie had bought some spices that she looks forward to sharing over a meal in Bahrain. Inside they have currency from Mexico, Australia, South Africa, Malaysia, India, Venezuela, and Cuba. 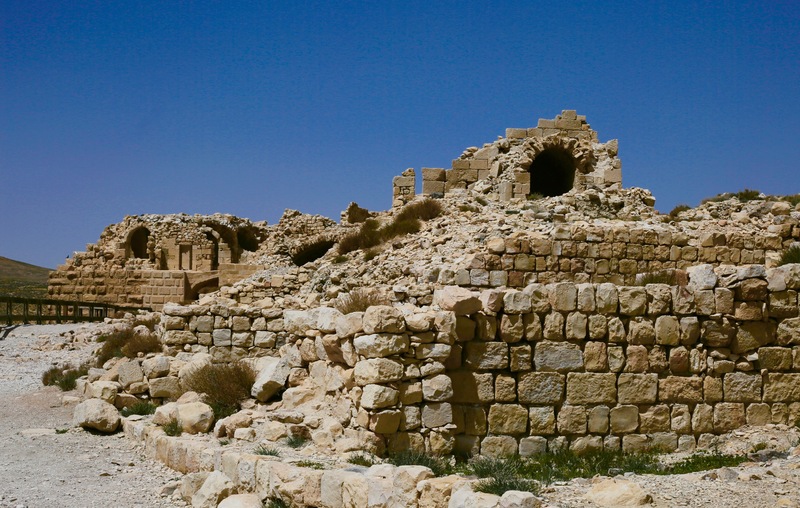 They also have one qirsh – the smallest denomination of Jordanian currency. 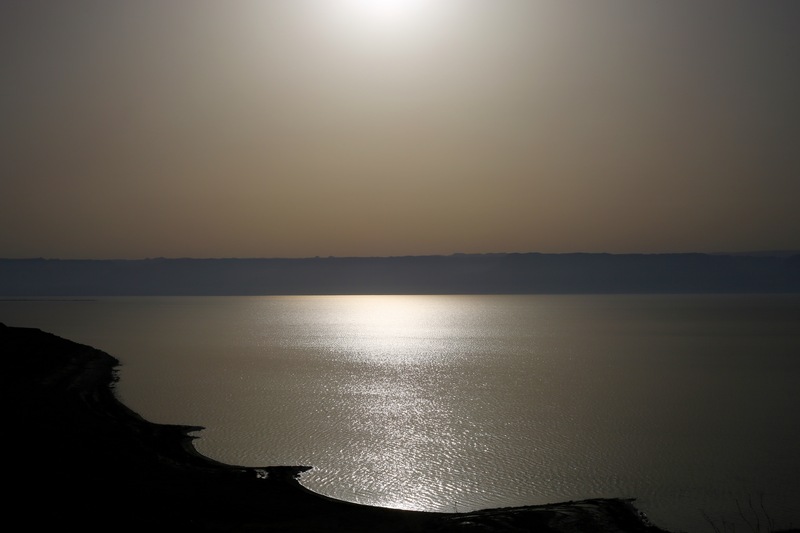 I drove us through the mountains in search of the Dead Sea. We stopped somewhere for the view at 2:50 pm and these two guys, parked there, kept saying something about the Dana Reserve. I took a photo with one of them and he got a different reaction from Julie when he tried putting his arm around her. We stopped 30 minutes later at Alhala Restaurant in Tafila. 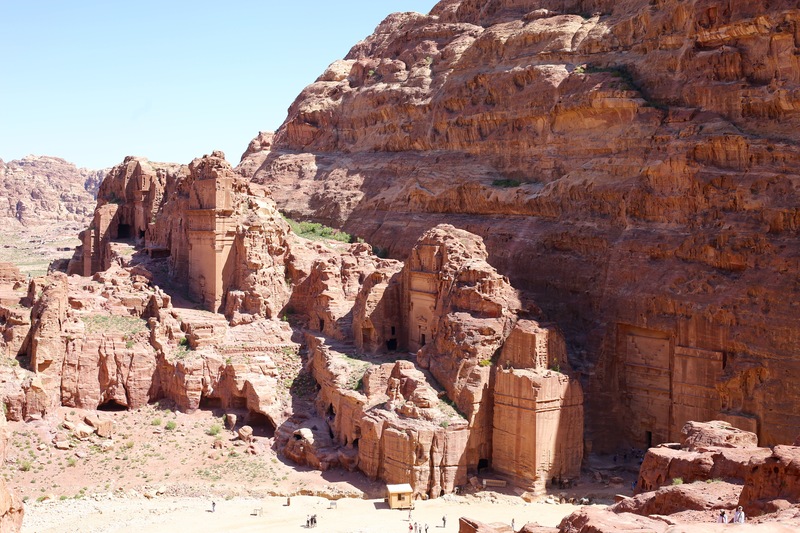 Julie felt we were in the middle of nowhere, as most places are in the desert, and wondered where their business comes from – over 80,000 residents and 50,000 travelers – thanks to Dana Reserve and the hot springs in the governorate. We paid 1 JD for a long shawarma with fries, tomatoes, and cucumbers, eaten off a Sports Authority tray. The staff showed us the large in-ground pots outside where they cook 100 chickens at once and told us that a shawarma stick can hold 200 chickens. We thanked them and got back on the road – and watched the hills go from green to brown to lake – as if the grass had melted into a pool. We first saw water on the horizon at 5:13pm and passed a sign for sea level at 5:20pm and thought we were getting closer to the Dead Sea – around the next bend, past the herd of goats, and the goodbye sign from the Municipality of Al Aghwar Al Janubiyya – and there’s just more road going along. I stopped on the shoulder for pictures of the sun on the water in front of us and the rocks behind us. 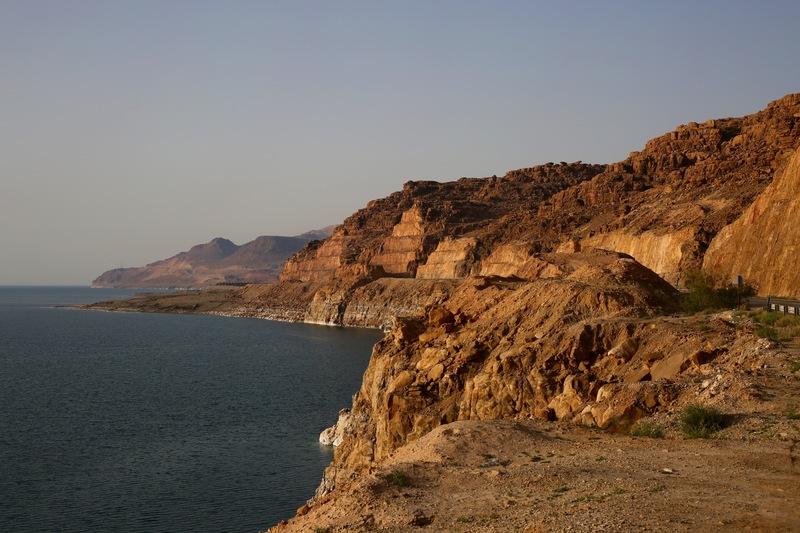 We stopped by Wadi Mujib’s dam (the exit of Jordan’s Grand Canyon – and the lowest nature reserve) for a picture or ten. We get approached by another friendly Jordanian and Julie says (paraphrasing), “thanks, but I gotta pee!” We follow Mohamed, over the cliff of no returns, to his chalet that he stays in while building the rest of the resort, so Julie can experience release. I was going to wait in the car, but the hanging wet clothes with the promise of water has me and the camera out on the prowl. I ask our host if we can go for a swim and he suggests (also paraphrasing), “fewer clothes means more sea on you”. I told him I planned on changing into a swimsuit, and he waited, and then helped us down the rocky embankment. 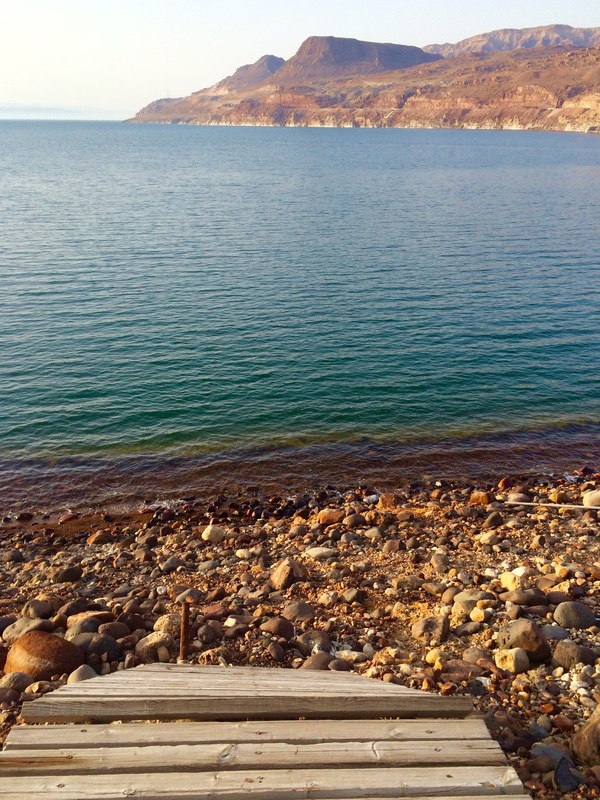 I’d seen what I thought was a wooden staircase to the beach – it’s not. Julie panics and I lighten the situation by telling her to cry it out so I don’t have to cry about my mom – she gets in the water. Luckily, she’s brought a waterproof camera. I leave mine with Mohamed. I walk into the water and am questioning my ability to float. Julie tells me to lift my legs and there is instant buoyancy. I think how great this is – not standing on inches of sharp salt that has accumulated on the rocks and I start to roll over until I get salt in my face holes – don’t do that! In the mess of things I somehow manage to get a salt jab to the derriere and this causes me to lay back and float – and take selfies with Julie as we’ve accomplished another bucket list item. Meanwhile, Mohamed has scraped up mud along the coast to cover us with. I go up first and he tries the same trick, “less swimsuit means more mud on you”. I tell him I’m fine leaving my bits covered. He already has more access to my body than any other man has had in years (I think couples massage 2009). He starts with my arms and I’m quickly transformed as Julie documents the process so Caleb can see as Mohamed makes me go from peach to black minus hands and feet. He starts on Julie and then we’re told to stand there and let it dry for maximum effect. I wait ten minutes and then wash off so I can capture the living colors around me as the sun sets at 7 pm and Mohamed is eager to get us out of the water before dark – a Middle East thing about borders, bodies, drugs, etc. I followed him on the rocks to a spot that would be easier for Julie to climb back up as she bobbed along in the water. I’m surprised more people haven’t turned their pools or spare tubs into mini dead seas as I now plan to do. Ten minutes later we were having ‘tea by the sea’ (hashtag) with a chunk of salt on the table that I picked up and Mohamed’s quiet friend. It was a wonderful moment, but over quickly as it would be slow going in the mountains with our brights on and lack of lane lines to follow. I was able to pick up the pace once we hit the city street lights. We went back to Dana’s so Julie could shower and I took selfies of my salty-muddy self at 8:40 pm before letting her have the bathroom. I washed my face, hands, and feet. I could see the salt in my hair and feel it on my jeans. It’s 9:15 pm before we leave the house. We go to the sheesha place so Julie can use their wi-fi to do homework while I play Tarneeb with Sara and Waleed – who will teach me the suits: cupa and dīnārī; and how to say, ‘How’re you?’ in Arabic: kayfa ḥālik? I want to try mansaf for dinner and they know just the place, but while Julie finishes her chat she gets two orders of cheese sticks and some garlic bread, so I order a bowl of booza (mastic Arabic ice cream with salep to slow the melting process) which is sticky with pistachios and chocolate syrup. I’m given four scoops, enough for the table, but they let me relish in this cold sweet at a dinar per scoop plus 0.5 JD for toppings. We leave the sheesha place at 11pm and Waleed drives our rental car. Julie has been looking forward to this so that he can call the company and complain about the crap condition of their vehicle. He tries to ask the guy if he would let his wife or daughter drive this and the guy argues that he’d be driving, but we’re assured that we will be getting a different car or a refund – which is up to Julie. 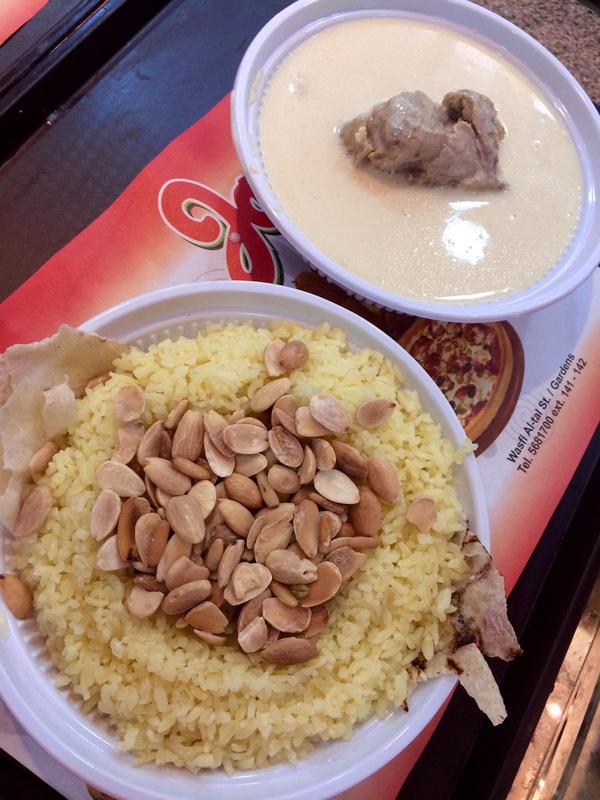 Sara orders two servings of mansaf – which is a bowl of bread and rice (nuts extra) and another bowl with lamb and yogurt as one portion. Julie is busying herself getting a slice of chocolate mousse cake and strawberry cheesecake. Sara pays for dinner at 11:45 pm. Waleed is right; this is filling. I finish the meat and half the rice and get the rest for take away to save room for dessert. Waleed brings two kinds of kanafeh – an Arabic sweet with cheese, to the table – one with crunchy vermicelli and one that’s spongy, both with pistachios. I start getting sleepy. We drop Sara off at her place at 12:50 am, then Waleed drives us back to the sheesha place so he can walk home. Julie moves from the passenger seat, so I stay in the back and sleep while she drives us back to Dana’s. I don’t know how lost she got, but we didn’t get there till 2 am and I still needed to shower. I went to bed with wet hair to wake up with. 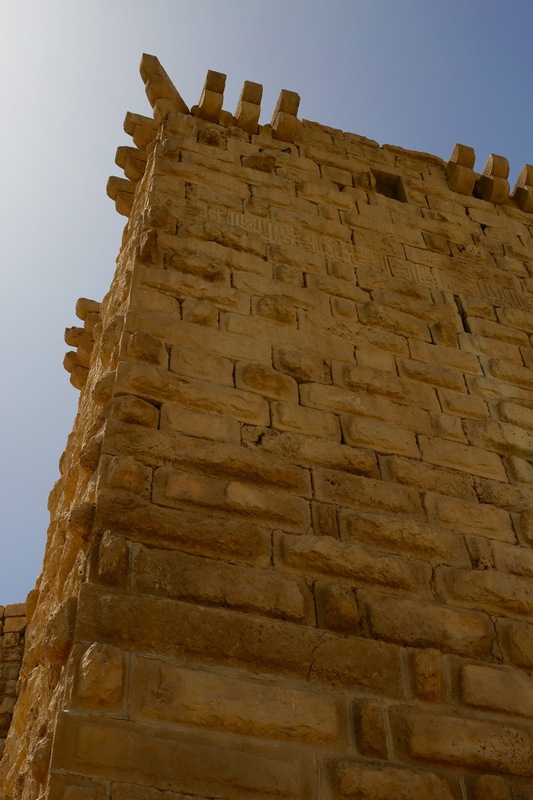 This entry was posted in Animals, Art, Education, Food, Friends, Hiking, History, Music, People, Photography, Travel, Water and tagged castle, Dead Sea, Jordan, mansaf, Petra, vacation. Bookmark the permalink.